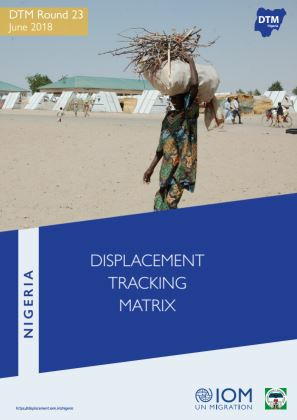 This report of the Round XXIII Displacement Tracking Matrix (DTM) assessment by the International Organization for Migration (IOM) aims to improve the understanding about the scope of internal displacements, returns and the needs of affected populations in conflict-affected states of north-eastern Nigeria. 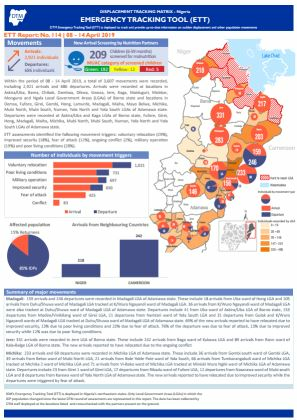 The report covers the period of 28 May to 16 June 2018 and reflects trends from the six states most affected by displacement: Adamawa, Bauchi, Borno, Gombe, Taraba and Yobe. 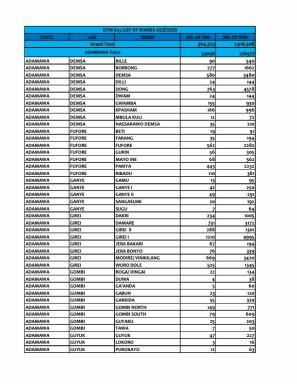 Round XXIII identified 1,918,508 individuals as being displaced in the affected states, representing a nominal two per cent increase (or 37,310 people) in comparison to 1,881,198 people recorded in the last round of assessment that was published in April 2018. Prior to this, a six per cent increase (or 98,708 people) was recorded in the Round XXII assessment as against the number identified in Round XXI (published in February 2018). 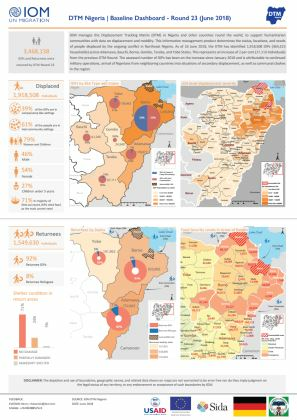 Though Round XXIII shows a marginal increment, the increase carries on the upward trend in the number of internally displaced persons (IDPs) recorded in recent months in northeast Nigeria. 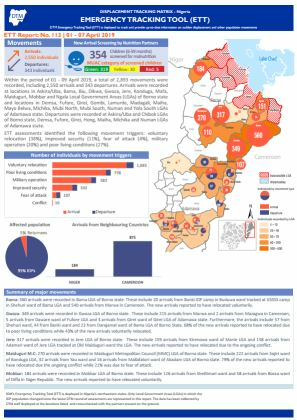 To gain insights into the profiles of IDPs, interviews with five per cent of the identified IDP population — that is, 86,195 displaced persons — were conducted during this round of assessments. The information collated and analysed in this report includes the reasons for displacement, places of origin and dwelling types, mobility patterns, and unfulfilled needs of the displaced populations. Additionally, site assessments were carried out in 2,388 sites, with the aim of better understanding the needs of the affected population. 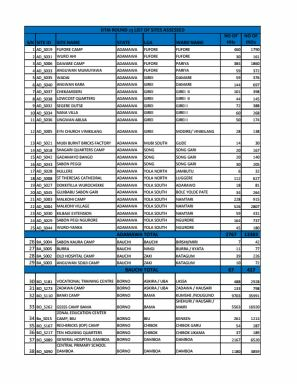 These sites included 282 camps and camp-like settings and 2,106 locations where IDPs were residing with host communities. 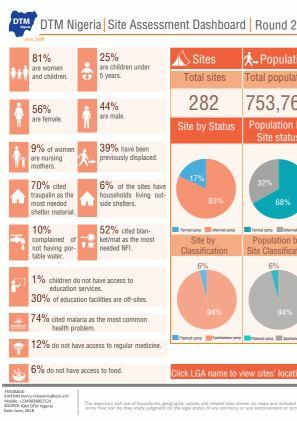 Site assessments included an analysis of sector-wide needs, including shelter and non-food items, water, sanitation and hygiene (WASH), food and nutrition, health, education, livelihood, security, communication and protection. 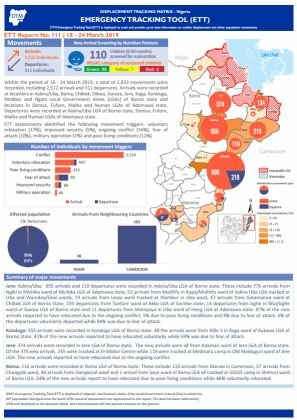 Given that the State of Borno is the most affected by conflict-related displacements, this report places a specific focus on data and analyses pertaining to it. 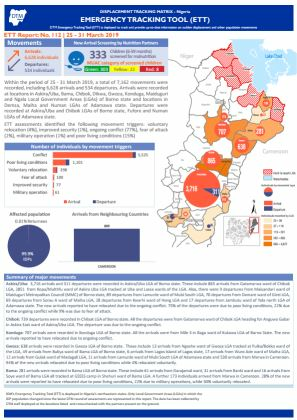 Lastly, this report includes analyses on the increasing number of returnees and their shelter conditions.